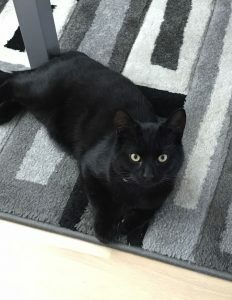 **ALL BLACK CAT MISSING SINCE THE EARLY HOURS OF 25/05/2018 – PEPPER IS A YOUNG HOUSE CAT WHO WE BELIEVE JUMPED OUT OF A SMALL GAP IN THE UPSTAIRS OR DOWNSTAIRS WINDOW. HE HAS NEVER BEEN OUT OF THE HOUSE ON HIS OWN BEFORE SO WE ARE VERY VERY WORRIED FOR HIS SAFETY. HE IS A LOVING FRIENDLY CAT SO WILL HAPPILY APPROACH PEOPLE AND I AM WORRIED HE HAS ENTERED INTO SOMEONES PROPERTY OR ONTO MAIN ROADS. PLEASE PLEASE IF YOU SPOT HIM CONTACT ME IMMEDIATLY. Last PostBlack and white cat found WickNext PostDouglas is missing!